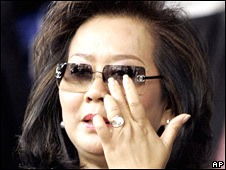 The wife of Thailand's former PM Thaksin Shinawatra has been sentenced to three years in jail for tax fraud. Pojaman Shinawatra was granted bail by a Bangkok court in the first of several cases against the former first family. Her brother and secretary were also found guilty of evading tax of 546m baht ($16.3m) in a 1997 shares transfer in the family telecoms business. The ex-PM himself, deposed in a 2006 coup, is being tried in the Supreme Court for alleged corruption. Pojaman Shinawatra's brother, Bannapot Damapong, was also sentenced to three years, while her secretary was handed a two-year sentence. The trio were freed on bail of 5m baht ($149,000) each on Thursday, pending an appeal. Mr Thaksin's wife, who is his most important political and business partner, looked stunned as the court delivered its verdict. Seconds after the ruling, she reportedly walked over to pat her husband on the back. Mr Thaksin's spokesman, Pongthep Thepkanjana, said the family would appeal and "fight to the end". A judge read out the verdicts in a televised ruling, saying that she should have been "a good role model as the wife of the prime minister". More than 1,000 supporters carrying roses and banners mobbed the family as they left the court. About 300 riot police were deployed in the area amid concerns of possible protests but there was no trouble. Unlike his wife, he will not be able to appeal if convicted. His party, Thai Rak Thai, was outlawed after the military coup, and Mr Thaksin was banned from politics for five years. He made a triumphant return from exile in March after his political allies in the People's Power Party set up a coalition government. After Thai authorities froze more than $2bn (£1bn) of his family's assets pending corruption cases against him, he is now reportedly worth $400m (£200m). The BBC's Jonathan Head in Bangkok says many Thais doubted this powerful and wealthy couple would ever be convicted but those doubts have now been swept aside. Under the new constitution brought in by the military last year the judiciary was given increased authority to hold politicians to account. Our correspondent says that as the cases pile up against the former first family, the judiciary is now being seen as perhaps the most powerful institution in the country.